I think this story is just amazing even though the plot has been used so many times it its different variations. In Shadow Wolf Mysteries: Cursed Wedding, you are to save the wedding, and not from just not being according to the plans, but from a great tragedy that may happen. 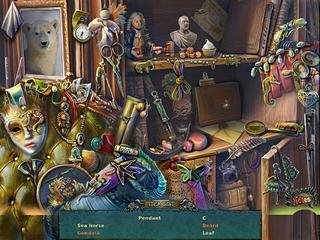 The game has basic features of a hiddne object puzzle adventure game. You come to Paris to help your friend named Veronica who is just about to have her wedding. But then things take an unexpected turn. It turns out that an ancient warewolf is in town and his goal is to ravenge Veronica and her fiance. But why? That's exactly what you are to find out. The game's audio-visual presentation is just outstanding. Great artwork create this shivering as you look at the wolf. There are some very well done voice overs. 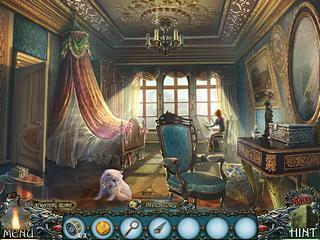 The game has basic features of a hiddne object puzzle adventure game. There are three levles of difficulty to choose from. There is no map to follow. And there are hints and skips. The hidden object levels do not stand out at all. They are just same old cluttered scenes with a bit of interaction. The mini games are all the same old ones and pretty easy too. It is sad that there is no surprise in this part of the game. The game has its pros and cons. A lot will depend on the level of experience that you have and your preferences. This is Shadow Wolf Mysteries: Cursed Wedding review. Download this game here.